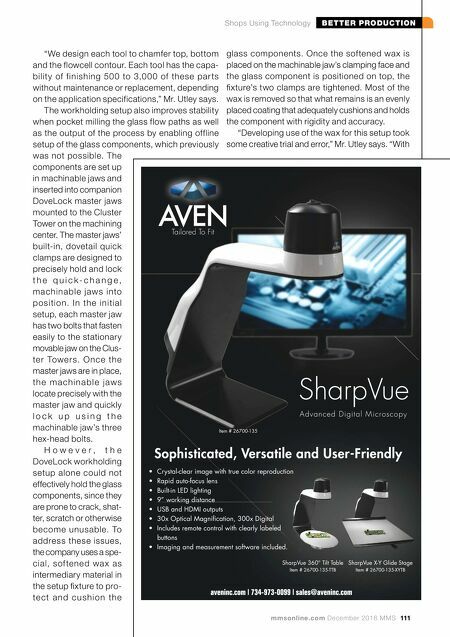 BETTER PRODUCTION Shops Using Technology 110 MMS December 2016 mmsonline.com to efficiently machine lights-out. Scott Utley, production manager and CNC programmer, says the HMC's shor t distance between the spindle end face and the center o f t h e p a l l e t e n a b l e s t h e c o m p a n y to u s e custom s hor t to ols, eve n ne a r the pa llet, to provide a more stable machining ope ration. The tools are set in CAT 40 toolholders, and t h e y o p e r a te c l o s e r to t h e f l owc e l l s u r f a c e tha n sta nda rd tools to e nsure f lus h c ontact w h i l e m i n i m i z i n g v i b r a t i o n . T h e t o o l s a r e either diamond-plated or diamond-bonded for different finish requirements. The new master of speed � KR AGILUS series When it comes to handling tasks, the KR AGILUS offers impressive results combined with minimzed cycle times. At the same time, the speed and accuracy make the performance of this small robot family unique in its payload ca category. Available in 6 and 10 kg payloads with an available reach of 700, 900, and 1,100 mm. 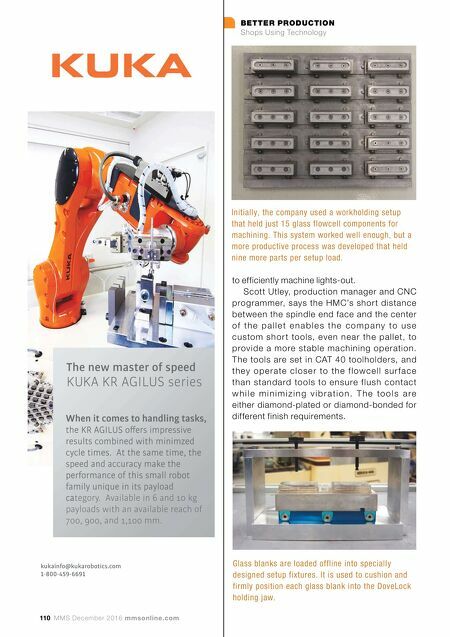 kukainfo@kukarobotics.com 1-800-459-6691 Initially, the company used a workholding setup that held just 15 glass flowcell components for machining. This system worked well enough, but a more productive process was developed that held nine more parts per setup load. Glass blanks are loaded offline into specially designed setup fixtures. It is used to cushion and firmly position each glass blank into the DoveLock holding jaw.